Welcome to the creation of my new series: Pasta alla Alcohol! Pasta is the perfect vehicle for intoxicating your eats, and each month I will choose a new type of beverage to incorporate into a tasty pasta dish! In the works is vodka, tequila, beer, and even gin. But for now, we will start with the most basic of basics: red wine. I tried to investigate the merits of adding red wine to pasta sauce, but I didn’t get very far. I will just take it on merit that people have been doing this for a very long time-and I certainly won’t take issue with it. If you don’t groove on greens, just leave them out. I’m just trying to get some veggies in wherever possible. I also highly recommend dousing the finished product with parmesan cheese, and serving with some homemade garlic butter breadsticks. Yes. 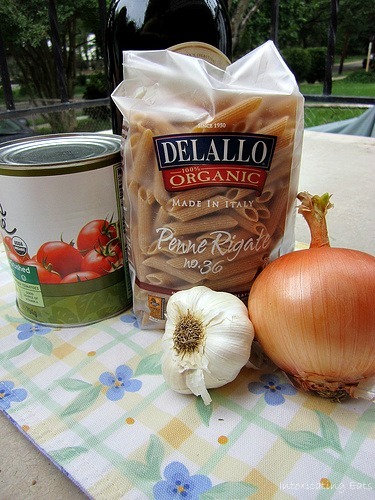 Bring a large pot of water to boil, add pasta and cook according to package directions. Drain and add back to the pot. Preheat a large skillet with some olive oil and dice the onions. Cook onions over medium heat for about 8 minutes. Mince the garlic and add, cooking 1 minute. Add the red wine and turn the heat up, scraping any onion previously stuck to the pan, and allow the red wine to cook off until most of it has evaporated. Add the tomatoes and seasonings, cover and simmer for about 10 minutes. Rest the spinach on top of the sauce, as much as will fit, and put the cover back on. 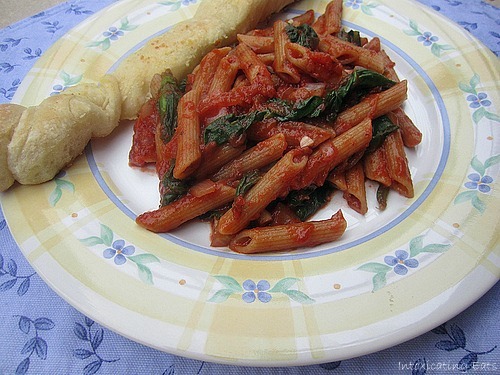 Let the spinach wilt down and stir it into the tomato sauce before adding more. 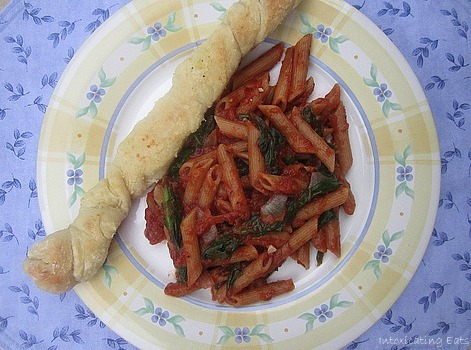 When all of the spinach has been wilted in, check for seasonings and combine with the cooked pasta. *If you are not into the greens, just leave them out and let the sauce simmer for about 15 minutes. Enter your email address to subscribe to this blog and receive notifications of new intoxicating posts by email.